Iman Ansari: More than any other contemporary architect, you have sought a space for architecture outside the traditional and conventional realm. You have continually argued that modern architecture was never fully modern and it failed to produce a cognitive reflection about the nature of architecture in a fundamental way. From your early houses, we see a search for a system of architectural meaning and an attempt to establish a linguistic model for architecture: The idea that buildings are not simply physical objects, but artifacts with meaning, or signs dispersed across some larger social text. But these houses were also part of a larger project that was about the nature of drawing and representation in architecture. You described them as “cardboard architecture” which neglects the architectural material, scale, function, site, and all semantics associations in favor of architecture as “syntax”: conception of form as an index, a signal or a notation. So to me, it seems like between the object and the idea of the object, your approach favors the latter. The physical house is merely a medium through which the conception of the virtual or conceptual house becomes possible. In that sense, the real building exists only in your drawings. 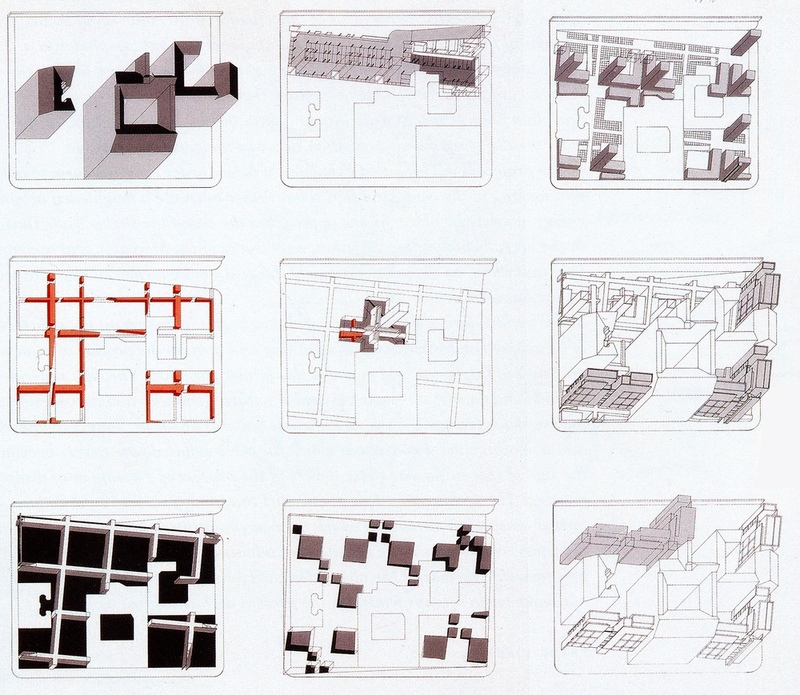 Peter Eisenman: The “real architecture” only exists in the drawings. The “real building” exists outside the drawings. The difference here is that “architecture” and “building” are not the same. Iman Ansari: So with that in mind, did you ever wish none of your houses were actually built? Peter Eisenman: No. Let me go back because you raised a lot of questions. If there is a debate in architecture today, the lasting debate is between architecture as a conceptual, cultural, and intellectual enterprise, and architecture as a phenomenological enterprise – that is, the experience of the subject in architecture, the experience of materiality, of light, of color, of space and etc. I have always been on the side opposed to phenomenology. I’m not interested in Peter Zumthor’s work or people who spend their time worrying about the details or the the grain of wood on one side or the color of the material on the surface, etc. I couldn’t care less. That having been said, it is still necessary to build. 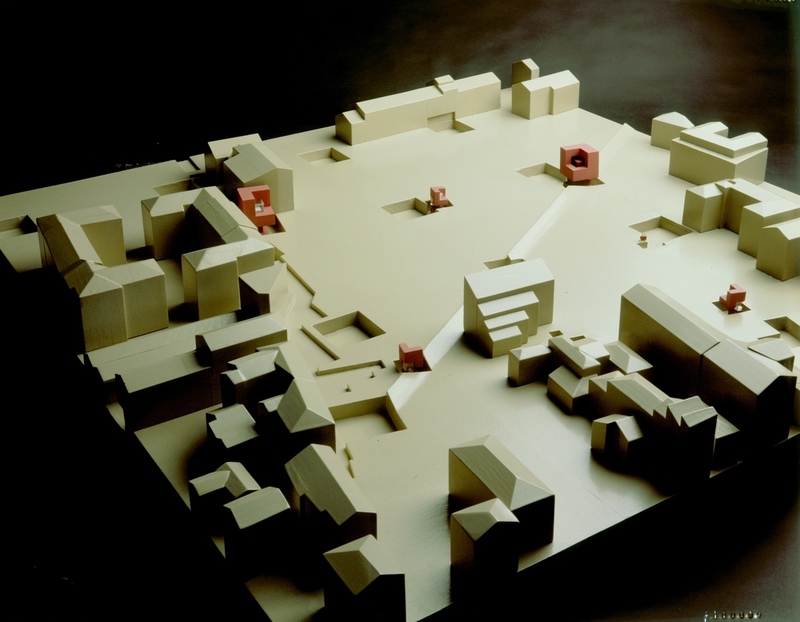 But the whole notion of the idea of “cardboard architecture” meant that the materiality of the work was important as an “anti-material” statement. 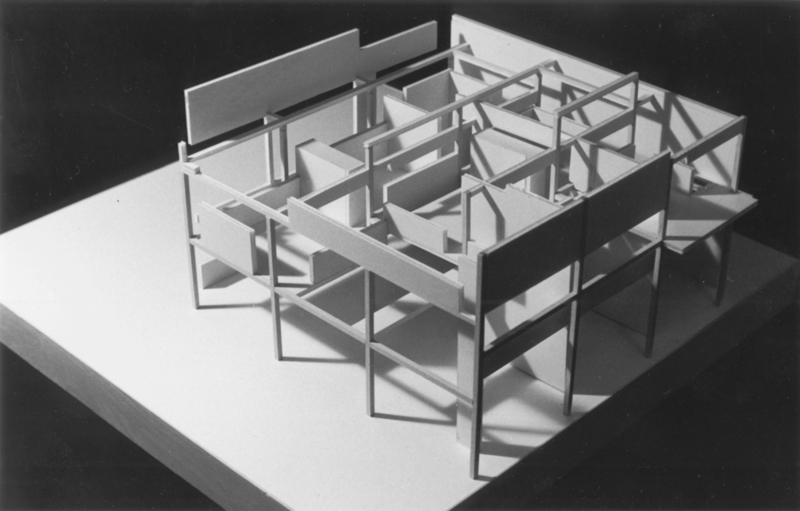 Probably the most important work I did in the conceptualist realm was the cardboard architecture houses. Pictures of house II, for instance, were taken without sunlight so you have no shadows, and no reveals or things like this, and in fact one of the pictures we took of House II was in a French magazine that said it was a “model of House II.” So I achieved what I wanted to achieve, which was to lessen the difference between the built form and the model. I was always trying to say “built model” as the conceptual reality of architecture. So when you see these houses and you visit them you realize that they were very didactic and very important exercises – each one had a different thematic – but they were concerned not with meaning in the social sense of the word or the cultural sense, but in the “architectural meaning.” What meaning they had and what role they played in the critical culture of architecture as it evolved over time. So while the work was interested in syntax and grammar, it was interested to see what the analogical relationships were between language and architecture. And of course that’s when I get into working with Jacques Derrida. Iman Ansari: What influence did Derrida have on your work? Peter Eisenman: Jacques was important in the later stage of my work because he said that it was possible in language to separate the sign and the signified – that is, the thing and its sign. What has made architecture interesting for post-structuralist philosophy is that architecture is about the relationship of the sign to the signified, that the column, for instance, is the sign of the column and the column itself; or the wall is the sign of the wall and the wall itself. In Alberti’s Palazzo Rucellai, there is both a grid system and a wall-bearing system, which says there is a redundancy or duplication of structural systems. This is also the case in my House II where there is also a redundant structural system. I would say my projects are “modernist” not only in a modernist style but also philosophically and critically, in the sense of Nietzsche, Heidegger, Derrida, and others. So when I built House II with a wall system that could support the house and a column system that could support the house, there is a sense of redundancy with the two systems. When you have this redundancy, the walls are either structural or signs. Is it possible, as in language, to separate out the sign and the wall to have what could be called “free floating signifiers”? This is where the world starts to become more complex in my work, and more problematic in terms of meaning. And then you get away from the house, because the house is too small to sustain an investigation at a different scale, which gets you to the architectural subject, which gets you to levels of sophistication of representation and lots of things happen. Now going back to the houses and to conclude that question, first, I never thought that I would want to build anything but houses because I thought that the house gave sufficient room to experiment with non-functionalities since there is no one type of functional organization for a house but there are architectural organizations. But that later proved to be problematic. The second thing was that I didn’t believe that it was necessary to ever visit my houses. In other words, there were houses that for the first six months or year they were open I didn’t even go to see them because I thought that wasn’t the important thing; the important thing was laid in the drawing. The Canadian Centre for Architecture, where part of my archive is, for example, has two thousand drawings that I made for House II. I would draw and draw and draw because I never knew what I was looking for. I knew the general parameters of what I was looking for, but I had no formula for setting up how to achieve it. Each house had an idea structure behind it. They all had a different investigation and started to get into bigger and bigger ideas and include more and more things that the earlier houses dogmatically left out. So essentially, that was a very important period of my work that stretched from 1967 to 1978 with Cannaregio. In Cannaregio something else happened. A photograph of House II was mistaken for a model by a French magazine. Iman Ansari: Can we pause here for a second before talking about Cannaregio. So don't you think because these houses existed cognitively they lost their true meaning the moment they were physically realized – the moment the “real architecture” turned into the “real building”? 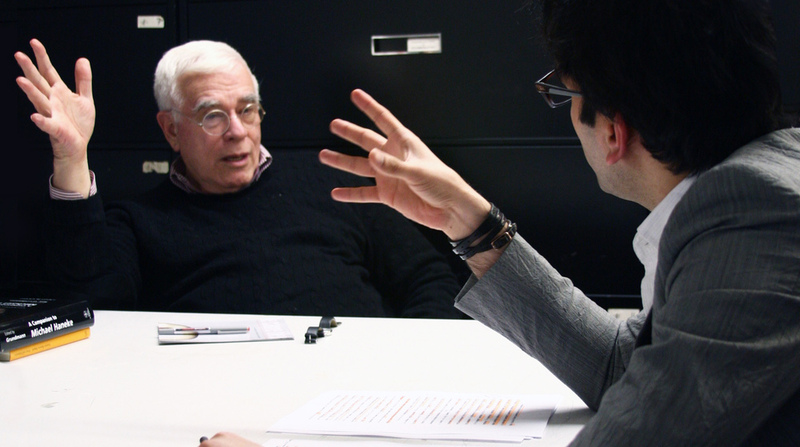 Peter Eisenman: Manfredo Tafuri once said something very important to me. He said, “Peter, if you don’t build no one will take your ideas seriously. You have to build because ideas that are not built are simply ideas that are not built.” Architecture involves seeing whether those ideas can withstand the attack of building, of people, of time, of function, etc. Tafuri said history will not be interested in your work if you haven’t built anything. I think that’s absolutely correct. If I had built nothing, you and I wouldn’t be talking now. Iman Ansari: So what would the building mean in that context? Do you perhaps believe that the built house or the “real building” stands as what you called the “built-model” of the “real architecture” that exists only conceptually? Peter Eisenman: Sometimes it does and sometimes its beyond, and sometimes its less. When you go to Cincinnati to see the Aronoff Center, the spatial experience is extraordinary. The didactic drawing itself is another thing. But they are two different things. I had to build Cincinnati, I had to build Wexner, I had to build Santiago, which is my latest project. You have to go and see it because you cannot draw it. You cannot cognitively understand what is going on. One has to see it and experience it in a way that is very different conceptually in terms of what I was after in the first. There are three phases in the work: One is the purely conceptual artifacts, which, as you suggested, may not have necessarily had to have been built. Two, are the ground projects, which are at a different scale and many of them had to be built. And finally you have Santiago, which is a hybrid project because it is neither a ground nor a figure. Iman Ansari: Lets talk about the ground projects and Cannaregio. Your early work was concerned almost exclusively with isolating and elaborating the architectural elements and operations that would ensure the autonomy and self-reflexivity of the architectural object. But in the Cannaregio project, we witness a new order that initiated the Citites of Artificial Excavation, and characterizes your work after that: The movement from structure to site or text, or better, from structuralization of the object, to the textualization of the site. Peter Eisenman: you could say from the linguistic operations to textual operations – because texts are quite correct about the site but they are no longer syntactic and grammatical, they are other. And if you say the early houses are analogically grammatical exercises to linguistic exercises, these are no longer analogical to language. I have lost the faith that language could be somehow an analogous model for architecture. I thought I had to find what I was doing within architecture rather than without architecture. So the reading that I’m doing, the work that I’m doing has much more to do with the text of architecture. And that didn’t happen accidentally. The first architectural biennale was Europa-America. Even though Paolo Portoghesi would like to think the Strada Novissima in 1980 was the first biennale, Vittorio Gregotti’s Europa-America in 1976 was the first architectural biennale. I had met Vittorio some years earlier at a conference in Spain, and he had appointed me as the head of the American section of the first architectural biennale in Italy, which included Raymond Abraham, Emilio Ambasz, César Pelli, a great montage of American architects. At the same time I was supposed to be finishing up the working drawings for House X. The client had dug a hole waiting for September to begin the project. I spent the whole summer in Italy and I didn’t pay attention to the working drawings. I came back and the working drawings were not done, and the client was furious; he fired me and refused to pay my bills. Iman Ansari: What effect did that have on you? Peter Eisenman: I was depressed, and I realized that my intellectual side, or cultural, side, and my entrepreneurial side had gotten way out of whack with where I needed to be. So I went into psychoanalysis, and in analysis I began to learn about the difference between living in your head and living in your body, with the reality of the earth, the ground. When Tafuri wrote “The Meditations of Icarus” in Houses of Cards, he meant that Peter Eisenman was Icarus, and to be Icarus meant that you wanted to fly and to look into the sun, as Icarus did. And to look into the sun meant that you were totally out of touch with the reality of the earth and the ground. Icarus, of course, gets too close to the sun, his wings of wax melt and he falls to earth. Icarus was the son of Daedalus, who made a labyrinth that was guarded by a Minotaur. It was an interesting mythology, which had to do with the ground, digging into the ground and making marks on the ground. Through my psychoanalysis sessions I realized that what was wrong with my architecture was that it wasn’t from the ground, from inside the unconscious, beneath the surface. So the first evidence of this occurs in Cannaregio where for the first time I do a project that is totally in the ground. And it’s not only in the ground, it’s also urban. But it’s also not real. It’s conceptual; and uses Corbusier’s unbuilt hospital project as an initial context. This is in 1978. In 1980 I’m invited to Berlin to do the Checkpoint Charlie project, which includes the garden of walls. You can’t walk on the ground of Berlin even though it is a project inscribed in the ground. And then I do the Wexner Center. A number of these projects fall within the concept of artificial excavations. The ground afforded me a critical dialogue with the then current (1978 – 1980) theory of Figure-Ground Architecture: the black and white drawings of Collin Rowe and the contextualists, work done for Roma Interotta using the Nolli map of Rome. What I was doing was the reverse. I was attacking the historicizing obviousness of “figure-ground” and trying to make what I call a “figure-figure urbanism.” And that of course had to do with my interest in Piranesi, and Piranesi’s Campo Marzio – actually we did an exhibition at the Venice biennale last year on the Campo Marzio. So all of these things come together. It’s not all gratuitous or superficial, in a certain way it’s a kind of life work for me. My own psychological work and my own thinking, my teaching, is of a piece. I cannot say that the first period was better or the second period was better; they were different and I was at a different stage in my life. And they have all relevance; they are both in text and in built form. I have both built and written in all three phases of my work. So that’s basically how I get to Cannaregio. Iman Ansari: I want to ask you about the use of Le Corbusier’s hospital in Cannaregio. Unlike the early houses that existed almost autonomously, in Cannergio you are suddenly confronted with the idea of a site - a real site, and in fact a very rich one: Venice. Yet, interestingly we see that even then, your approach was to invent a site, in fact an “artificial” one. And what interests me the most is how you used Le Corbusier’s un-built hospital in Venice as point of departure, and used the grid of the hospital as a generative system in your project. And finally when you draw the project you include the hospital with your project with no notational difference. How do you read Le Corbusier’s hospital in your drawings? Were you suggesting that the hospital is part of your proposal and meant to be built along with your project? Or were you implying that your project should also remain un-built as Le Corbusier’s hospital did? Or was it neither or both? A meaningless clue? Peter Eisenman: First of all, it's not a meaningless clue. But I was suggesting neither. You are reading them in an interesting way, but I didn’t think about that. Here is what I was thinking about: I needed something in the site, in the context of the Derridean notion of absence and presence. To me the discourse of absence is very important in the ground projects and in the idea of the trace. Freud talks about how Rome was built on a series of traces of levels; that going into the unconscious is digging into the traces of history that have been sedimented; your own history, cultural history that you have to get at. And so Corbu offered one layer of that cultural history. In other words, you’ll see in Berlin I did the same thing with the grid of 1760, the grid of 1830, and superposition of traces, which is how Rome evolved, how Berlin evolved, how cities evolve; I have always been interested in the evolutionary process of the physical traces left by the previous building. It didn’t matter if it was built or not built, and it didn’t matter whether I was going to build my project or not. It mattered that the idea of using the trace as a key, as a beginning to project something, to make a project. To me Cannaregio was the turning point in my work. It is that hinge that Derrida talks about, the hinge between the before and after. So it becomes an important project. It was necessary to find a way to make a project. Because there was no program. And if you notice, all the projects were different. Venice was losing population; it didn’t need housing, it had an adequate housing stock; so I said, let’s make holes, and that’s what I did. But also, is the ground the holes or is the ground the stuff ground the holes? And is the figure the ground? And the kinds of questions that these pose. And of course the question of scale came in, because I used my House 11a here at three different scales: a real scale or the house scale, and model of the house scale, and then the house becoming the model of a larger project. So the question of scale came in which had never been in my work, the question of ground came in, the question of trace came in, and many of the issues that would subsequently articulate my work are manifest in Cannaregio. But looking back, Iman, can I say I was conscious of all these things I’m telling you? I don’t think so. No matter how conscious the work seems, a lot of it was swimming under cloudy water trying to find the edge of the pool where I could get out. It wasn’t so clear that I knew exactly what I was doing. I never have known what I was doing. In fact I teach the idea of project in my classes at Yale, and I still don’t know what my project is. I know I have a project; I know Corbusier had a project, I know Mies had a project. If you said look Peter you talk a lot about the idea of a project, what is your project? I’m still trying to figure out what my project is. Iman Ansari: It’s interesting what you are saying. But I think my understanding of Cannaregio and the use of Corbusier’s un-built hospital as a clue or the point of departure is that the hospital becomes for you what Venice was for Le Corbusier: a site, but here it is one that is not actually there. And what that bring me to is the role of drawing. If the drawing is the site, then the drawing is there, but if Venice was the site, Le Courbusier’s hospital wouldn’t appear there. So again similar to the houses, Cannerigio project only makes sense as a drawing. So it seems to me that drawing in your work emerges as the fundamental medium” analogous to writing in language. So with the advancement of our tools, do you think that drawing’s role (that direct cognitive relationship with the drawings and the physical act of drawing) is diminishing in contemporary architectural practice? Peter Eisenman: I will tell you this, I cannot read a book on Kindle. I have to own a book, and I have to write in the book. When I read I take notes, I go back over it. You can see my books are full of notes in different pens and colors and times because when I read a book today that I may have read ten years ago, I read it differently because I’m different. I have to take notes over time in books, so I own books. That’s number one. To me, drawing and reading are the same thing. I can’t read on the computer. So anytime someone draws something in the computer, I want it printed so I can draw over it either with tracing paper on it or without it. You cannot make a plan in the computer by connecting dots. You have to think about a diagram or what it is you are doing. You have to think in drawing. So to me, all of my work, even the last competition that we won in Turkey, is drawn by hand first, then we give it to computer guys and then they model it and then we get it back, etc. I think in drawing. Drawing is a way of thinking. I can’t think or write ideas on a computer. I don’t type on a computer. I write and if you look at my desk, it’s full of paper. So to me drawing is a form of writing, and a form of reading what I write. So I don’t see any difference. To me drawing is not making pretty things or making representations. It’s not representing anything; It is the incarnation of the thing. I’m not trying to represent something; I’m trying to make it real. And the only way it can be real is through my drawings. Architects and architecture students today have lost the capacity to think through drawing. They can only think through a computer. I watch people in this office sitting and looking at these things on their screen as they roll them around in space, and I think to myself: what the hell are they doing? It is nuts, It’s totally wacko. You know, what does a section look like? What does a plan look like? They don’t seem interested in that. Iman Ansari: In that sense drawing almost comes as an after thought. Once you model the object or the “thing” in 3D, then you can cut plans and sections of it. Peter Eisenman: Exactly, but I start with the cuts. I build from the cuts. Iman Ansari: So looking at your work before 1978 and Cannerigio, your work incorporates two standard structuralist principles: First, the bracketing of the physical and historical context, and second, the bracketing of the subject in favor of a notion of an inter-subjective structure of architectural signification. Your houses intentionally excluded all the semantics in favor of syntax, and expressed a sense of structuralist objectivity in their representation: using wireframe axonometric drawings - as opposed to perspective - or the black and white photos of the house in snow that appears detached from any context, and deprived of any human subject. 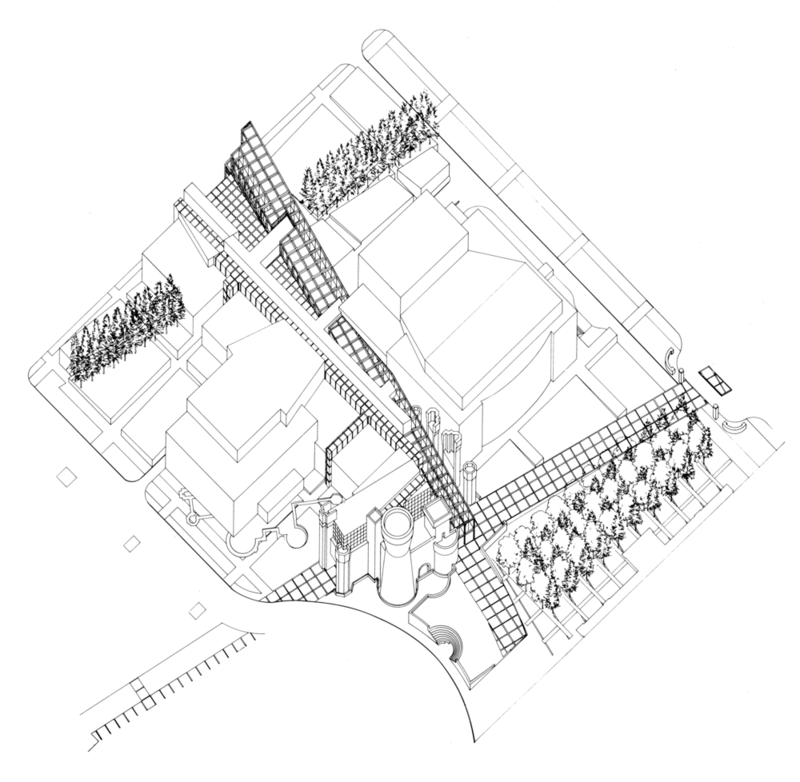 By the time we get to Cannerigio we begin to see the inclusion of the first principle within the project: the physical and historical context, even though it is still an indexical one since Le Corbusier’s hospital didn’t actually exist in the site. But at the same time, we also see how the different scales of House 11a in Cannaregio or the size of the voids in the ground appear unrelated to any human scale, program, or function for that matter. We see similar approach in your other ‘ground projects’ in that era. Is it fair to say that you have moved away from the structuralist principles that defined your early work? And if so, when exactly does the individual subject of architecture and the subjective experience of space come into play in your projects? Peter Eisenman: I would say the work up to Cannaregio was structuralist, and then became post-structuralist. But in terms of the subject and the whole idea of affect and the subject, and the experience of the subject, a person like James Joyce, when he writes “Finnegan’s Wake,” is not thinking about the reader, he is thinking about his work. Thomas Pynchon is not thinking about the reader when he writes “Gravity’s Rainbow”; he is thinking about his work. A painter doesn’t care whether somebody understands painting or not; he is interested in the discourse of painting, adding to the knowledge of the painterly. Architecture as well is not a populist idea, it’s not about social surveys. Architects are not anthropologists or sociologists. However, my work does not erase the subject. The subject is one of many constituencies of architecture. I believe that the reality of my work makes you feel something – especially the later work, which becomes affective when you are in the space. That’s why you can’t just look at the drawings of Cincinnati, you have to go to Cincinnati and experience the space. Maybe you can’t even write about it. The same thing with Santiago or the memorial in Berlin. When you walk in the field of pillars you experience something very different from an ordinary urban space – it has nothing to do with the holocaust; it has nothing to do with the program, but the space is different, the sound is different, the materiality is different, and so the affective experience is. It’s not like walking in Central Park. Being in my spaces is not like going on a Sunday outing. It requires a certain amount of energy, concentration, and participation. It demands the participation. Iman Ansari: The reason I’m asking you this is that after Cannaregio we also begin too see a level of subjectivity, or rather “inter-subjectivity” emerge in your work, which I agree is has less to do with “affect” or the feeling of individuals experiencing the space, and more to do with the cognitive interaction between the individual subject and the architecture. The reading of the project, as you suggested, demands that kind of physical and mental participation. I think your 1980 competition entry for Checkpoint Charlie in Berlin is the best example of that. In this project we see very similar challenges with respect to the site and context as we did with the rest of the Cities of Artificial excavation. We see again the idea of traces, of layering, digging or excavating the site and the city. But the superimposition of the grid here is not anything like the previous projects. The grid is not simply expressed as marks on the ground or a slightly depressed topography, but it is a series of 3.3-meter walls that extend the existing Berlin wall. I think this is the first time that we witness the critical role of the individual subject in your work. The human subject is now literally confined inside the void container of the grid. He then climbs out and walks on the walls. The walls and the grid form a new datum. Inhabiting the un-inhabitable barriers, the individual subject observes the void spaces he were in before as archeological ruins that are already buried below. The project here relies heavily on the human subject and his or her experience. And the architecture intentionally addresses the individual’s scale, movement, time, memory, and his or her overall perception of the space. In fact, I believe it is this very subjectivity that holds the project together. I also think this is a critical moment in the evolution of your work: from the early houses that act as autonomous architectural objects, To Cannaregio in Venice that is suddenly confronted with the site and acknowledge the context, and finally we arrive in Berlin where the project engages the human subject for the first time. This is a project that I would say cannot be understood in drawings except through understanding the narrative. Peter Eisenman: Iman, look, you’ve answered your own question. Cannaregio was a hinge from the past to the present. The first project I do after Cannaregio is Berlin. And Berlin is as Cannaregio, but also digging into my own unconscious, producing a project that we don’t know that it’s for the left or the right; in fact the mayor of Berlin said: Look, I can’t build this because everybody is going to hate this project. The right wing is going to hate it; the left wing is going to hate it. But it certainly had to do with the individual, and his or her being in the space. No question that when you walk on a wall that is 3.3 meter high it is the only space you can walk on, you are now walking on a new datum in Berlin, which is the datum of the Berlin wall. So the wall doesn’t even exist anymore, it is now part of the fabric of this project. And then when you go into the watchtowers and you walk up and you cannot see anything because there is no viewing out. And then you see the ruins below. All of this is about the experience of moving up and down and across of the human subject. So there is no question that the human subject enters the project, and you cannot understand the project, as you said, unless you can conceptualize what it would be like to be the human subject. Even though it’s not built, you can conceptualize what it would be like. It would be quite an extraordinary experience. That’s why architecture, finally, has to involve the subject in an architectural manner. In other words, that was purely architectural, as it was political, as it was real. It didn’t mean anything; it had layers of meaning, traces of German history. But its real message was: we can no longer walk on the ground of Berlin. We have to walk on another ground. The ground of Berlin is tarnished by history. And like we did in Rome and other places, we have to walk on another ground. But it was the subject walking. So we are talking about a post-structural subject. It is at that moment after Cannaregio that post-structuralism comes in. And after that, all the projects change, and they do have an affective experiential condition. No question about that. And I can tell you this, you go to Cincinnati, which is after that, or you go to Santiago, or you go to the Berlin memorial, and you’ll feel something. You can’t take pictures of it or draw it, but you feel something, an experience you cannot capture in drawing or photographs. Iman Ansari: Let's talk about cinema. I know you are interested in cinema and I heard you say before that your houses were influenced by the avant-garde or conceptual filmmakers of the time – Peter Kubelka especially and the idea of flicker films where the spectator connects the frames and animates the process rationally in his mind. And in your houses – the Fin d’Ou T Hou S for instance – you take that idea and you collapse all the frames of that animated process into a three-dimensional space: the Fin d’Ou T Hou S has the L-cube at different scales and different stages. I also know you are a big fan of Michael Haneke and I remember you speaking about him when you were at Harvard three years ago. You said, “architects should make architecture the way Michael Haneke makes films.” If we look at the development of cinema in the 20 century, we can witness a similar evolutionary process. The first modern movement in cinema (the work of Eisenstein, Jean Luis Baudry and Christian Metz) is when films for the first time acknowledge the fact that they are films: cinematic products recorded as a series of still images that are animated with a projector on a screen and are being viewed by mass spectators. The second modern movement, if we may call it that, can be attributed to the work of filmmakers like Michael Haneke. Peter Eisenman: It’s probably the third. The second is something other than Haneke. He is not the product of Godard, Truffaut, and Antonioni; he is the product of Herzog, Fassbender and the third phase of the modern evolution. He is not in the second. He is very much in another phase of work. Iman Ansari: So when we look at Haneke’s work in relation to early modern cinema, not only does the film acknowledge that it is a film, but also that it is being viewed by an individual spectator. It is the acknowledgment and recognition of the subject/ spectator and his or her experience and emotions that distinguish this era from before. The meanings or emotions here are not prescribed for a mass collective audience by the filmmaker, but rather the reading of the film (and with that the feeling and emotions) relies heavily on individual spectator’s experience, and the mental interaction with the film. 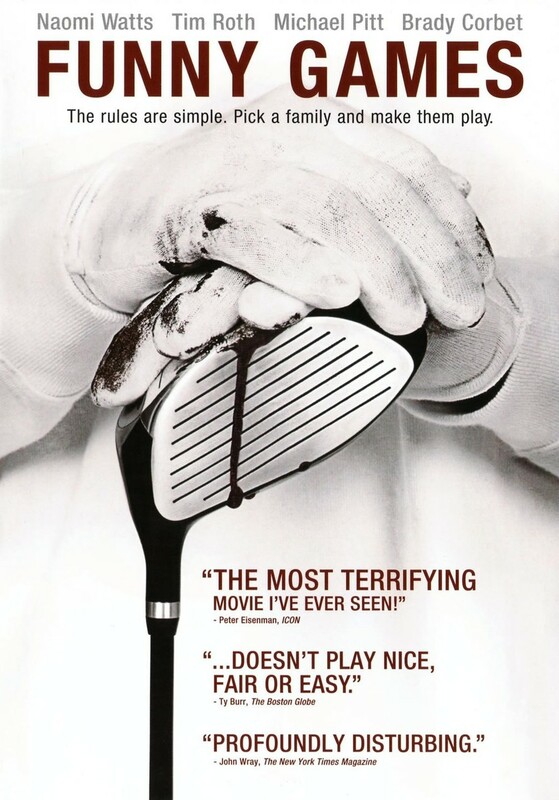 Haneke’s Funny Games takes that to the extreme. Peter Eisenman: Yes, and that’s the post-structualist phase of cinema. Godard and those filmmakers were structualists, that is, they are not talking to anybody. They don’t care if there is anybody in the theatre. But Haneke, is talking directly to the spectator. In “Funny Games” for example, they stop the film and they say, we are going to run it back. He is playing with the audience all the time. The audience is really manipulated by Haneke. It’s amazing; I don’t even want to tell you about his last film because I know you haven’t seen it yet. I think that Haneke – and don’t forget he is almost the same age as I am – he is in what I consider to be the third phase of film. And I’m in my third phase, and I don’t know what it conforms to in the overall architectural scene. But certainly his work has very little to do with the current filmic production. But I don’t think filmmakers or literary people or any artist is really too concerned in specifically looking at production as they are in understanding what kinds of productions happen in their time. For example, I’m interested in the literature of my time, the film of my time, the philosophy of my time, the paintings of my time. I’m not much interested in what’s going on in architecture, but rather in the culture around me. I could care less about “hedonistic sustainability.” I’m interested in what Ian McEwan is doing in writing or Jonathan Franzen, or Haneke in films. That’s why I’ve worked with Derrida, I’ve worked with Richard Serra, I’ve worked with Haneke; I have worked with a lot of people outside of architecture. They are more important to me and to my work and thinking. Iman Ansari: I’m interested in this idea of “new subjectivity” that you talked about with respect to Haneke’s work, and in fact you wrote an essay about that in a new book about Michael Haneke. I think your Checkpoint Charlie project in Berlin in fact comes very close in creating that form of subjectivity and a similar experience for the architectural subject. Peter Eisenman: But I agree with you. Iman Ansari: But we have the Checkpoint Charlie project, and then we arrive at the memorial project in Berlin and Santiago where something else happens. 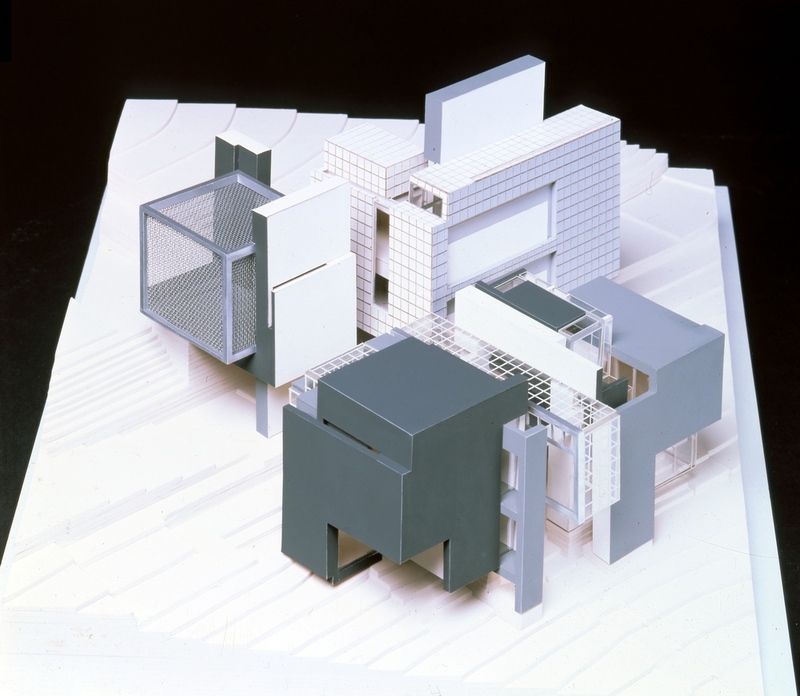 Peter Eisenman: Something very different. But you can’t say that the memorial has anything to do with the main evolutionary, red thread of my work. I would say Santiago much more so. But the Berlin memorial was a special thing because it was a special program, and it’s an aberrant production, let’s say, its so demanding of being different that it’s not the same. So I don’t count Berlin (memorial). The Holocaust project in Berlin is not inter-subjective, whereas the Checkpoint Charlie project is. Iman Ansari: But do you think your recent work is moving towards that kind of inter-subjectivity? Do you see a correlation between your work and Mcihael Haneke’s with respect to that kind of New Subjectivity? And do you think architecture could or should explore that kind of subjectivity? Peter Eisenman: I can’t say that. I never know. You would have to tell me about that, because I can’t be conscious of what I’m doing. I don’t know if I’m moving towards Michael Haneke. I think architecture ought to explore architecture. I’m trying new things in architecture. The proposal we made for Istanbul is a new project. But it has nothing to do with Michael Haneke’s project, not at all, nor anything to do with Richard Serra. I watch Michael Haneke, I read Derrida, I read fiction, I go to movies, I go to exhibitions, but I’m interested really in the architecture. For example, the seminar I’m giving at Yale this semester is on Alberti. I think we need to study Alberti in order to understand where the modern began, where the idea of history began, and where the metaphysical project began, and therefore where we are today in relation to Alberti. So I’m going twelve lectures on Alberti. And that has nothing to do with Michael Haneke. Iman Ansari: On a closing note, You have said before that if we as architects make two or three “canonical” buildings in a lifetime – buildings or architecture that is on the edge, that’s already a lot. I want to ask you, which one of your projects do you think is the most canonic, in that it represent those critical moments in your work? Or to put it differently, which projects, if you were to pick one, do you wish to be known, and remembered by? Peter Eisenman: Well, I would say Cannaregio would certainly be the first but it’s not built, and you have to have a built project. Then it gets fuzzy… I can’t tell about Santiago because its not finished yet. Berlin is too off on the side. You might say my Cincinnati project. You could say the Reinhardt Haus but again it’s not built; it’s a provocative project. One of the ones that I would have liked to have built, or my favorite unbuilt project was the Quai Branly, the Museum in Paris. I think it’s a fantastic project and I really wanted to build that project. But there are so many projects. There are over 150 projects, and I only built about 25 of them. So there are a lot of projects. But here is where I think your question is wrong. I believe that some of the texts are as important as the building projects. Because I’m not just a ‘building architect,’ I’m also a ‘writing architect’ and a thinking architect and a teaching architect, so to me the writing is as significant in my work as the buildings because they are both the same.